We live in a time of an unbelievable and increasing amount of information, options, stimuli, and demands on our time. This influx comes from email, commercials in at least 4 or 5 types of media, from our families, businesses, and communities. Who wouldn't like an extra 8 hours added to their day? Sign me up, too. Until we figure out how to add time to the clock, here are 10 tips for reducing the feeling of overwhelm so you can enjoy your life more, reduce stress, and actually make space for your desires to come to you. If your life is packed to overflowing, there isn't room for spontaneity and surprises. As women, I believe we are taught and socialized to nurture others. We tend to be the leaders in our families, change agents in our communities, and volunteer everywhere. This is about making choices that also serve YOU! Cool tool and website called "My Lifebook"
I just heard about this website and program, called My Lifebook. It's got an amazing website and testimonials that are powerful. I have no personal experience with this program and so I offer it for your exploration. I just read a great 42-page document written by one of the leaders in the coaching industry, Milana Leshinsky. I am sharig it with you because it has value for any new or experienced solopreneur who wants to grow their business, make marketing easier and more natural, and create a business that allows you the ultimate freedom to take off a week, a month or a year if you choose or have to for the sake of health or family or fun! Check out my recommendation and get the link to get this free resource by using the continuation link below. Network the Way You Shop! 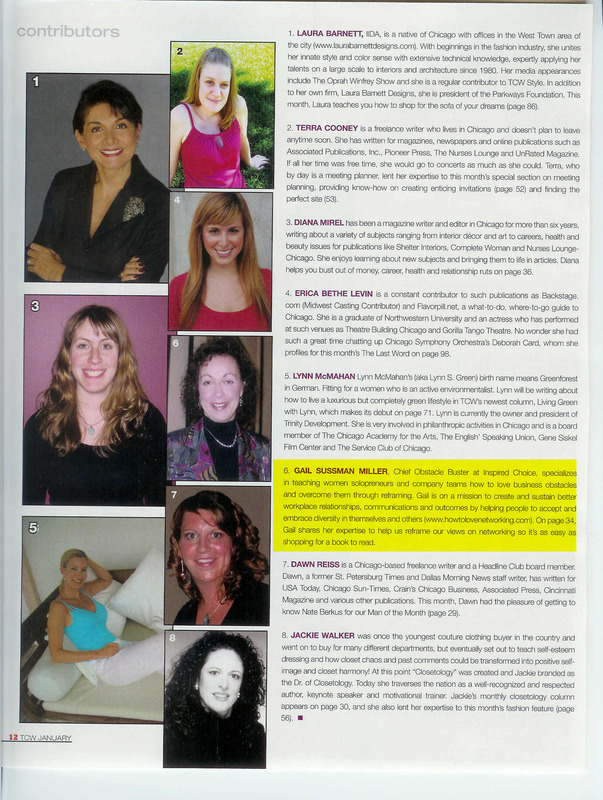 The January 2008 issue of Today's Chicago Woman (TCW) features an article by Gail called "Network Shopping... Network the Way You Shop for Greater Success". It describes a way to transfer skills from one thing you know how to do well, like shop for a book, to a new mindset to make networking easier. 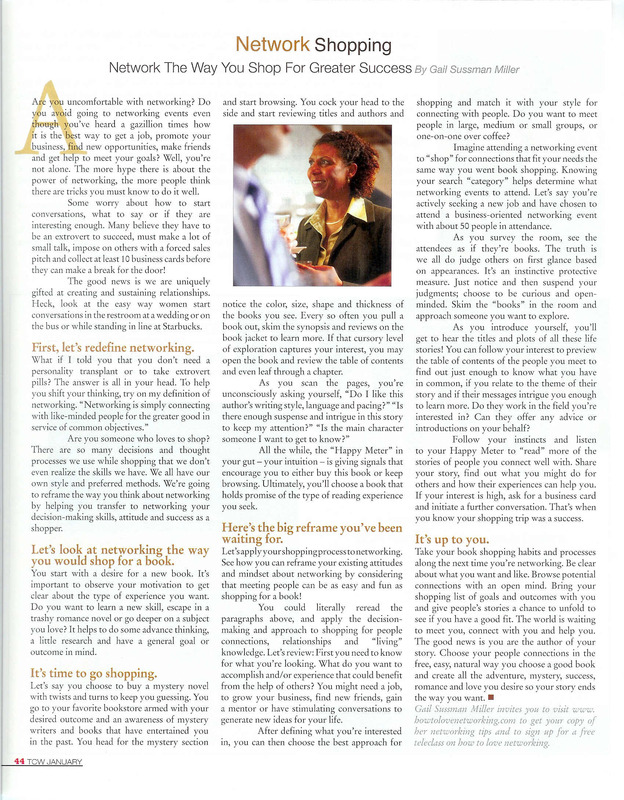 Are you uncomfortable with networking? Do you avoid going to networking events even though you’ve heard a gazillion times how it is the best way to get a job, promote your business, find new opportunities, make friends, and get help to meet your goals? Well, you're not alone. The more hype there is about the power of networking, the more people think there are tricks you must know to do it well.